Simple, Rugged, Versatile for the Everyday User. 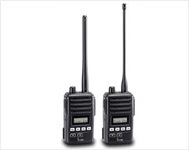 Affordable, high performance radio that offers abundant features. Firefighters, Police, Security and Public utilities each profession has its own unique challenges, but the one thing in common is the need for reliable communications. 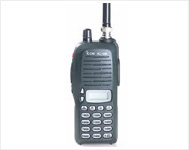 The ICOM IC-F51/F61 offers a compact waterproof, MIL STD package that is easy to use. Rain or shine, this radio keeps you in contact in nearly any environment. Firefighters, Police, Security, Oil industry and Public utilities, each profession has its own unique challenges, but all have one thing in common: the need for reliable communications. 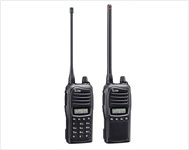 ICOM's IC-F50/F60 offers a compact waterproof, MIL STD package, which is easy to use. Rain or shine, this radio keeps you in contact in nearly any environment. IC-F14/IC-F14S Simple operation for everyone but a powerful and reliable tool for your daily business. It's very durable construction is resistant to shock and vibration. The dual rail guide design securely locks the battery pack to the radio. 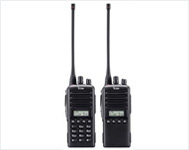 Wide range frequency coverage, Li-Ion battery pack, loud and clear audio, built-in signaling and option unit connector combined with Icom grade electrical performance, the IC-F14/S series will easily exceed your expectations. 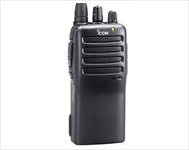 The Icom IC-F24-01-RC business two way radio is a heavy duty 4 watt 400-470 MHz UHF radio designed for daily use while being very practical and economical. 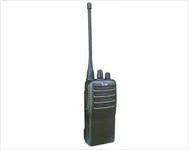 The IC-F24 is a mil spec, and very rugged 16 channel radio ready for use in a wide variety of business environments. 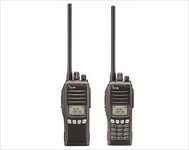 The Icom IC-F24 is ideal for companies that need reliable, durable radios that are also affordable and easy to use. For small or big businesses who need economical and instant two-way communications, the IC-F11 series provide simple and quick contact at any time. The Icom F11 Radio was a VHF business radio. It has been discontinued by Icom and the replacement radio is the F14. 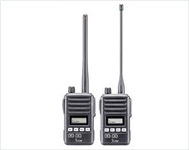 The ICOM IC-F21 UHF portable radio is for small or big businesses who need economical and instant two-way communications, these handheld provide simple and quick contact at any time. Performance is never in question. Built-in multiple tone signaling, both wide and narrow channel spacing, 3 steps of output power and other superior features set a new benchmark. 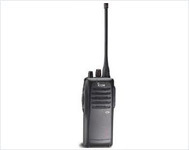 Icom (VHF) Commercial Handheld Transceiver. IC - F33 GT Along With 256 Channel,2 Tone-5 Tone Radio. MDC 1200 compatible. Special Option scrambler. This is the new direction in LMR communications. 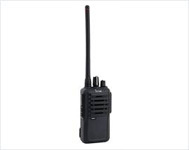 IC - F3021simple to use but versatile rich featured radio. 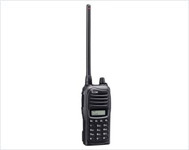 is rugged handheld easily exceeds your expectations with reliable performance and communication quality. 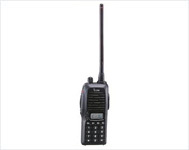 The Icom IC-F3021 Radio is a 128 channel handheld radio in VHF frequency with up to 5 watts of power. 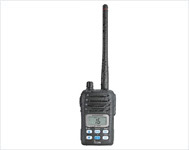 This powerful business radio features a complete keypad and digital display for advanced communication needs. A first in the LMR industry. With the optional UT-119H, the IC-F3161 series provides 6.25kHz digital narrow mode communication that meets the FCC 6.25kHz emission mask requirements for narrow banding, and increases efficiency of channel allocation and use of spectrum. The IC-F3161 series provides 2 optional slots: one optional slot for the UT-119H digital unit and one for another option board. ICOM IC-M1V is World's smallest waterproof handheld marine radio. The self check function checks internal temperature, connected battery voltage (over voltage detection), PLL lock and water intrusion. VHF Marine Radio With MIL-STD810.Power Control From Front Panel . 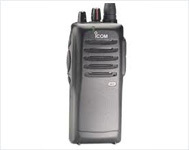 The Icom IC-M88 Handheld VHF Marine Two Way Radio is not just another marine radio. 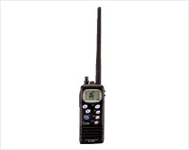 This is a tough radio, built to take the harsh conditions both at sea and on land. The IC-M88 is small and simple to use. Its contoured body is easy to hold. The IC-M88 also has a removable antenna so you can connect it to a larger fix mounted one to increase its range. High power Radio. With key Pad & display & 200 memory channel With PC Cloning capability. Durability, dependability, operation simplicity, style, ruggedness, economical use, and more are required for commercial transceivers. But only a few such transceivers are available, particularly for portables. Now from ICOM-the IC-F3G series of portable transceivers aim to become the most highly reputable of all commercials. Superior performance and features, everything you require is included. Icom's technology gives you satisfaction you never knew before.